Homemade Chicken and Dumplings is a favorite comfort food of so many people. 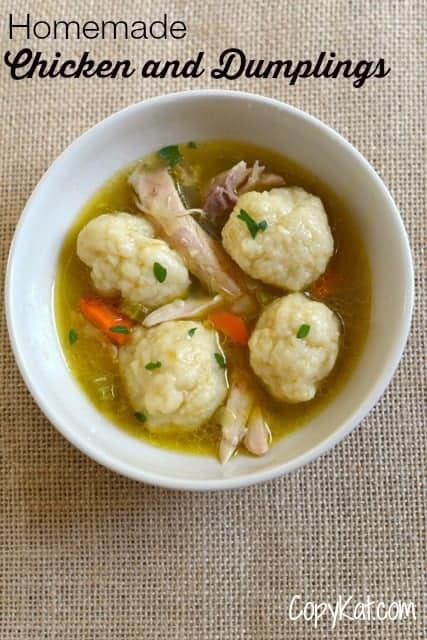 Savory chicken soup combined with fluffy dumplings is a dish that so few can resist. Chicken and Dumplings is a favorite dish in the South and in the Midwest. This dish may have its origins in the Great Depression. Chicken is often boiled in a seasoned broth, and then the chicken is removed from the broth and picked clean from the bones. Dumplings are cooked in the broth and while the dumplings are cooking chicken is added back to the soup. The result is a wonderfully almost creamy soup with fluffy perfectly cooked dumplings. Homemade Chicken and Dumplings is an inexpensive and tasty dish to make. I personally think it is one of the best dishes to warm the soul in cold months. This soup uses two different cuts of chicken to prepare this dish. I like using both chicken thighs and chicken wings. Thigh meat has a wonderful rich flavor, and the wings provide collagen that will make a thick and hearty soup without having to add extra starch to the dish. I begin by cooking the thighs in their own fat, I don’t want to dilute the chicken flavor. Vegetables are then cooked in the chicken fat, and the pan is deglazed with a bit of sherry. If you don’t drink alcohol, deglaze the pan with some chicken stock. Our dumplings are fluffy because we add a bit of baking soda and half and half in the dumplings. These two combined together will give the dumplings a nice rise. The butter will give these dumplings a wonderful flavor that you are certain to love. Homemade Chicken and Dumplings are the perfect cure to a bad cold, or even on a cold day. Salt and pepper both sides of chicken thighs. Place chicken thighs into a skillet over low heat. When the fat from the chicken begins to render out cook chicken for 4 to 5 minutes over medium heat. Flip chicken thighs over, and cook for another 4 to 5 minutes. Remove chicken from skillet and set aside. Add chopped onions, sliced celery, and sliced carrots to the skillet. Sprinkle a small amount of salt over the vegetables. Saute vegetables until the onions are translucent. Add dry Sherry to skillet and scrape the bottom of the pan until the browned bits are no longer sticking to the pan. Place partially cooked chicken thighs, chicken wings into a stock pot. Add vegetables and liquid from the skillet to the stock pot. Pour chicken stock into the stock pot, and cook the soup for about 30 minutes on medium heat. Remove chicken from stock pot, and allow to cool. Leave the stock pot on the stove over medium heat. While the chicken is cooling, prepare the dumplings. In a medium-sized bowl add flour, sugar, salt, and baking soda. Stir the dry ingredients together. Stir in half and half and melted butter. Stir the dumpling dough until it forms a ball. Shape dough into golf ball sized pieces and drop them into the stockpot. Debone chicken and place it back into the stockpot. Cook for another 10 to 15 minutes. The dumplings should increase in size, and be fully cooked. If desired sprinkle with fresh parsley before serving. First…Stephanie, I love your site and recipes. They’re your interpretation and everyone is entitled to their own. I believe you help a lot of folks who’ve never made a certain recipe. With that said, I think Natalie was a bit offensive, giving the impression SHE’s right and you’re wrong!! (Nasty!) Use whatever form of dumpling you like…simple! The first thing my Mom did when I bought my house was show me how to cut up a whole chicken…I still do it her way. If I’m going to fry chicken, I’ll bag and freeze the ‘soup’ parts….backs, wings, necks, giblets (sometimes)….anything I want to make my soup with. That way, I always have some parts when I want soup. After a while, I have enough for a big pot! Any soup is open to interpretation!! Use any seasonings, herbs, veggies, add-ins you want.. I feel this way about any recipe because everyone doesn’t like everything. So make it your own, your way. Stephanie, thank you for everything you do!! Thank you, Lauren. Stay warm. I used to live up in Michigan, I know how cold a winter can be there! Thank you very much for your informative video. I will definitely use your recipe and method when my wife and I next make chicken soup. Homemade Chicken and Dumplings is an expensive and tasty dish to make.” You obviously meant to write ‘inexpensive’. This is real chicken and dumplings. I don’t like the Southern-style flat dumplings at all. In fact, I don’t even know why they are called dumplings. They are really more like pasta. Drop dumplings are an entirely different thing. I really enjoyed this recipe. I can’t wait to make it again. Ok, thank you for your review of how the recipe was written. How do you make your chicken and dumplings?